Description: The subject was created from the combined efforts of the Gen Krullnar from Warrior Guyver 2’s universe and the Creator Dibblis from W’Kar’s universe. The two were able to capture W’Kar so they could recreate his unit’s technology and merge it with Warrior Kavzar and W’Kar’s Jy-Taki into a hybrid extremely powerful warrior. The result was a warrior that had the energy efficiency of a Warrior Guyver but with the impressive energy handling capabilities of the W’Kar. The subject was so powerful it took the combined efforts of Dreadnought, Zeus, Black Nova, Warrior Guyver 2, W’Kar, Fighter Guyver II and Xetel to defeat him, and even when he was destroyed his control crystal created a dimensional vortex that sent part of Krullnar’s Clanship into our universe and sent Dreadnought in Female Warrior Guyver’s own universe. Warrior Guyver 2 reported there were other Atrahasis that were still not finished. Should these beings had survived the destruction of the ship and manage to make their way here, extreme priority should be taken to terminate them as their threat is even greater than Chronos. Present estimates of subject’s abilities have been compiled and summarized below. Subject’s physical strength was extremely impressive which was estimated to be approximately equal to 6,000 men in his base form. However, he was able to use various forms of Power Boosting such as the CPMs or the W’Kar type Warrior Rage which allowed him to nearly double or triple his strength. The subject had a combination of power generating methods at his disposal such as the HSL the Warrior Guyvers possess that would have given him unlimited stamina but was also reported to be able to drain energy from his surroundings and from attacks also supplementing his own power. The technology that was scanned from W’Kar allowed the subject to handle and channel extreme amounts of power without burning himself out. Lastly, the subject was reported to possess a self generating anti-matter source within his control crystal that allowed to readily access large amounts of energy at will. This source though was dangerous that when the subject was killed, it caused a sun to go super nova and create a dimensional vortex. -SPEED: Subject’s speed is indeterminate but has been estimated to be much faster than even Dreadnought. Subject was fast enough to keep up with multiple opponents at the same time. The subject is presumed to have possessed the same teleportation method as a Warrior Guyver but was not seen as the subject also possessed the ability to teleport in the same manner a being calls upon or disengages a Guyver unit. The side benefit of this teleportation method was that it created a blast field which could be used as a weapon. The subject seemed to have the ability to teleport anywhere in the galaxy at will. Subject’s durability was extremely impressive in that without using shields the subject could withstand even a CPM boosted hyper smash from Warrior Guyver 2 with his body shield only. Even without the subject’s body shield he was reported to withstand mega smash level attacks. His regeneration was also approximated to be similar to Dreadnought’s. When the subject raised his shields, the subject was impervious to most attacks and required the level of firepower dozens of times more powerful than a Gigantic Guyver’s Giga Smasher. The range and capabilities of the subject’s hyper sensors were undefined but has been estimated to at least equal Dreadnought’s but with greater range. Subject’s main control crystal laser was determined to be well over the power of a hyper smash level attack. He also possessed two additional crystal orbs located on each of his palms. 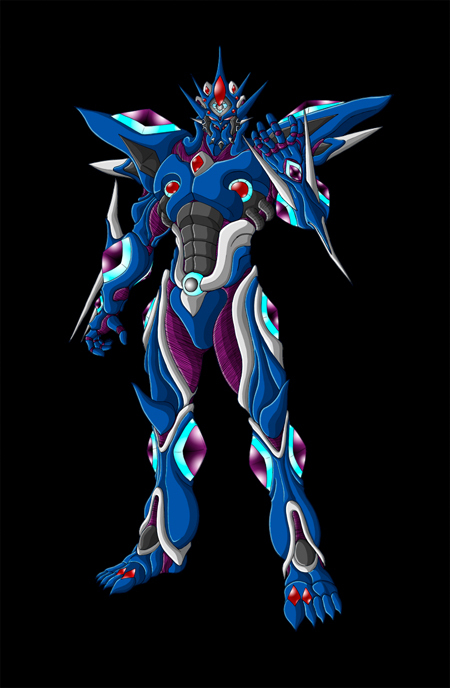 Indeterminate but estimated to exceed a Warrior Guyver’s in capabilities well over a hundred times more powerful. Subject possessed the same configuration as a Kavzar with one sword located the elbow and two located side by side point forward. Each of these blades were polymorphic in nature like a Warrior Guyver’s and were of much greater density than normal. The swords also emitted a plasma field that gave them additional destructive power. These swords were reported to break even Dreadnought’s and W’Kar swords. Subject was able to fire pressure cannons that well exceeded the power of even a Warrior Guyver’s hyper smashers at will and even larger ones that approached the power of a Gigantic Guyver’s Giga Smashers. Subject also was able to fire something called a Bio Wave which instead of gravitational energy, the subject used his own bio energy. The power of this attack is on par with his gravitational attacks. The subject has all of the zoalord attacks that a Kavzar would have but at much greater level. Subject was easily capable of creating real Black Hole attacks nearly at will. Subject was able to drain energy from his surroundings and even from opponents to create attacks at will when combined with his own energy. Range of attack and power ranged from small energy beams in the mega smasher range to extremely powerful energy blasts that was seen to be several times more powerful than a Gigantic Guyver’s Giga Smasher. Subject was seen to be able to neutralize and create time dilation effects on his surroundings by slowing down time to a hundredth of the normal speed. Subject’s CPMs appeared to be of much greater power than normal. It is theorized that the energy storage capabilities of the system was enhanced by the subject’s much greater tolerance allowing the system to draw more energy. The level of attack the subject was able to create was approximated to be in the same class as a Gigantic Guyver’s Giga Smasher if not much greater. Similar to the Gigantic Guyver’s but dozens of times more powerful. He was able to readily fire these weapons at will and the beam lasted ten seconds. It was reported that these weapons also affected hyper space making them one of the very few weapons that could directly kill a Warrior Guyver. The subject’s control crystal was a much larger and powerful version of a Warrior Kavzars that also had multiple layers so that it could control the vast arrays of attacks and abilities the subject possessed. The control crystal also housed a self generating antimatter supply that allowed the subject to draw upon for powerful attacks. The damage control of the control crystal was such that even when extremely damaged the subject still retained a large portion of his powers and kept the antimatter under control. The unit also can send the host into Hyper Space to recover from battle or teleport automatically. A battle backup transports the control medal into hyper space so it can remake the host’s body without interference. It is presumed the subject’s HSL systems is linked to the Hyperspace orb to allow him to pull immense energy directly from hyper space. Combination of the W’Kar Warrior Rage and Cyclone Power Matrix. The subject appeared to have two boosted modes with the first one appeared to be a primarily CPM boosted mode that effectively nearly doubled his abilities. The second power boost was a combination of the CPM and Warrior Rage. In this mode his abilities were estimated to be tripled but, the subject was only able to use it for a maximum of two minutes before all his power was drained and suffered immense strain. The subject was difficult to scan and determine his abilities and the above are only estimations as his true power remains unknown. The subject may have had additional powers not seen.